You can easily remove a Customizer panel or section with some custom code. First, some WordPress terminology. 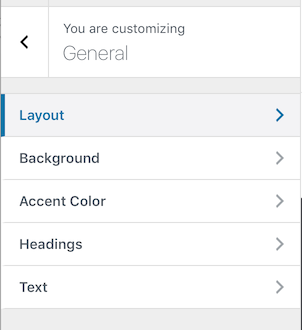 There are Customizer panels and Customizer sections. The difference is that a panel is a tab that contains subtabs, whereas a section is a tab with no subtabs. For example, the General tab is a panel because it contains subtabs, as shown in the following screenshot. See the table in the next section to find out which tabs are panels and which are sections. Here's the code you can use as a template. It creates a function and ties it into the appropriate WordPress action hook. In this case it removes the Presets section from the Customizer. To remove a panel instead of a section, use remove_panel instead of remove_section. Change the ID of the panel or section, following the table in the next section. Add the code to your child theme's functions.php file. In order to use the code example above, you need to know if the Customizer tab is a panel or a section and its ID. We've prepared a table to make this easier.